In this episode, Jesse and JP dive in to opaque result types, which could help prevent leaking of implementation details to library consumers. We discuss Jordan Rose's recent forums post on a proposed plan for module stability. A recent type checking speedup had very small source compatibility breakages, but nonetheless went through the evolution process and it was accepted! The Never type has some very unique properties and behavior. We introduce the type and discuss a recent proposal (SE-215) to make it conform to Hashable and Equatable. We welcome Kelvin and Vincent to the show to discuss Data Structures and Algorithms in Swift. An in-depth conversation about Swift 4.2 and beyond with Ted Kremenek, Manager of the Languages and Runtimes team at Apple. We discuss the announcements from WWDC 2018 with special guest, Greg Heo. We discuss recent proposals on adding unicode properties to characters and Unicode.scalar. Escaping or non-escaping? That is the question. IUOs are dead, long live IUOs! With this change, IUOs are no longer a type but rather a special variant of Optional. Now that Swift for TensorFlow has been open sourced and documentation is available, we share some very interesting findings. Swift will soon have a more robust hashing strategy, and it doesn't involve always returning zero for hashValue. Randomness gets a long overdue Swift treatment. We cover a few recent Collection & Sequence Swift Evolution proposals. It happened. Google forked Swift. Swift for Tensorflow has wide-reaching implications and we just had to share our thoughts. We cover two recent Swift Package Manager proposal pitches. We go over the Swift 4.1 release highlights with Ben Cohen and Doug Gregor from the Swift team. Part 2 of 2. We go over the Swift 4.1 release highlights with Ben Cohen and Doug Gregor from the Swift team. Part 1 of 2. Thoughts on Dave DeLong's "protocol wishlist" for Swift and other ideas for improving Swift's protocols. Swift.org is officially participating in the Google Summer of Code program, and there are some great project ideas. We dissect Michael Ilseman's recent document with potential optimizations and improvements to String in preparation for ABI stability. Swift 4.1 will include support for conditional protocol conformance, and we're excited to use it! We discuss the recent efforts improving & instrumenting the Swift compiler's performance. We discuss Chris Lattner's recent "Dynamic Member Lookup" proposal. The source compatibility suite has been useful in catching compatibility issues before official Swift releases are cut, but it leaves much to be desired especially around communication with project maintainers outside Apple. Think thread safety with Swift is the same as C languages, with slightly different syntax? Think again! Brief discussion around some recent proposals. How do you even profile without Instruments.app? We discuss Swift’s numeric protocols and types, especially those of the floating point variety. We discuss the first release of the HTTP server library from the Swift Server APIs project. We share our tips for measuring & improving Swift compilation times, as well as share some news about recent efforts to test compile times within the Swift repo. 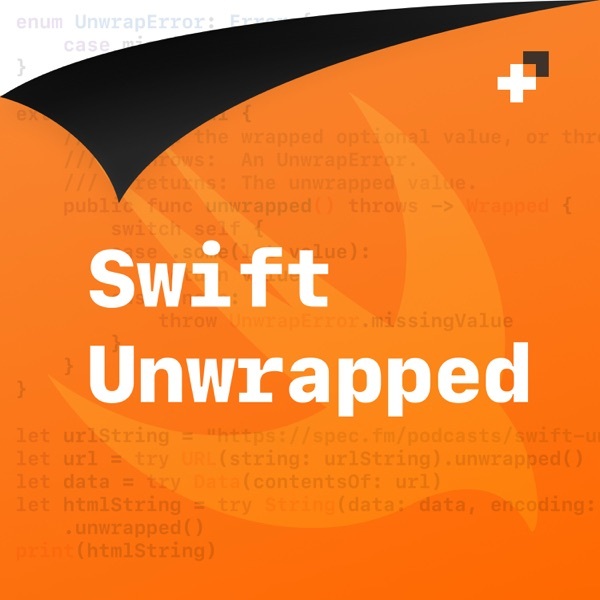 We welcome Mike Ash to the show to discuss the implementation details of weak references in Swift and how they've changed. We discuss some recent Swift Evolution proposals, Xcode 9 GM, along with a boatload of Follow Up (tm) from Ted Kremenek and Pierre Habouzit. We welcome Chris Lattner to the show to discuss concurrency in Swift 5 and beyond! We share our thoughts on the newly announced goals for Swift 5. The fourth and final episode in our series on ABI Stability, we cover the remaining categories of decisions that must be made to stabilize the ABI. Continuing our series on ABI Stability with a third installment, we focus on the mangling component and address some past mistakes. Following last week's episode on the big picture of ABI Stability, we focus on two categories of decisions that need to happen to get there: data layout and metadata. We clear up some of the misconceptions around what ABI stability means, how we'll get there and why it's important. We dissect the newly open sourced part of Swift tooling that helps us port our apps to the latest Swift version. A month after WWDC, we share our thoughts on the announcements and events from the week. Taking a break from Swift itself, we shine the spotlight on the open source community and highlight some lesser-known open source Swift projects that we think are interesting! Exploring the many different ways in which the Swift compiler is tested. The state of error handling in Swift and a brief history on how we got here, as well as comparisons to Objective-C.
Part two of our discussion on the new features and improvements in Swift 4! There were so many great things to discuss, we needed two episodes! We discuss some of the new features and improvements in Swift 4! We share our hopes & expectations for the Swift language at WWDC 2017. We debate if Swift evolution is pulling its weight, and if it's possible for Swift to remain "open" without the cost. A brief overview of the complex topic of memory ownership revisions currently underway. We cover 3 recent Swift Evolution proposals and the new Swift Compatibility Test Suite. We go in way over our heads into Swift's String Manifesto. We unpack the recent SE proposals on serialization & encoding. There has been a ton of debate on the Swift Evolution mailing lists about access control in Swift. We share our thoughts on the situation. This week we celebrate the release of Swift 3.1 and the large set of improvements to SwiftPM that happened just under the wire. Continuing from episode 4's take on Objective-C Bridging, in this episode we look at Objective-C interoperability. There's been a constant push and pull on ObjC bridging since Swift 1.x, trying to seek a balance but always swaying in the other direction. The up (and down) sides of striving for source compatibility across Swift versions. Let's rearrange some deck chairs! The tumultuous tales of the community getting SourceKit compiling on Linux. A retrospective on one year of open source Swift.